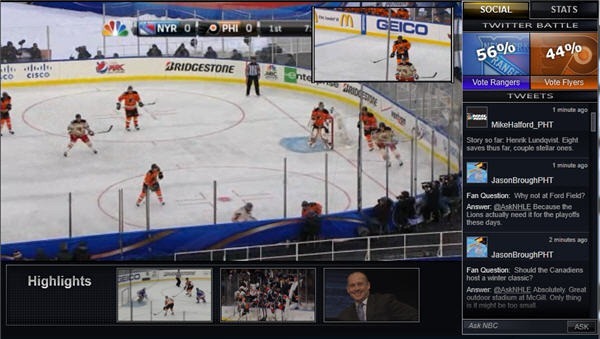 The NHL Hockey games broadcast on NBC are also live streamed online with NBC’s NHL Extra, which features DVR control, online-only camera angles, and in-game highlights in stats. NHL Extra is essentially NBC’s SNF Extra re-purposed for Hockey. There are a few additional camera angles that can be viewed with the Picture in Picture at the top right. The Goalie camera, fir instance, let’s you view all the action from directly behind the goalie when the puck is in their zone. Click the “Swap” button to switch the main screen and the PIP video feeds. The Reveal button at the lower right to access the Twitter feed, stats, and Highlights. You can even send your questions to to be answered by Jason Brough and Mike Halford of ProHockeyTalk.com. You can check out the full schedule of games broadcast on NBC and the NBC Sports Network. The NHL games on NBC (generally Sunday afternoon games) are streamed live online via NHL Extra, but not the games broadcast on NBC Sports Network. Missed the last game? 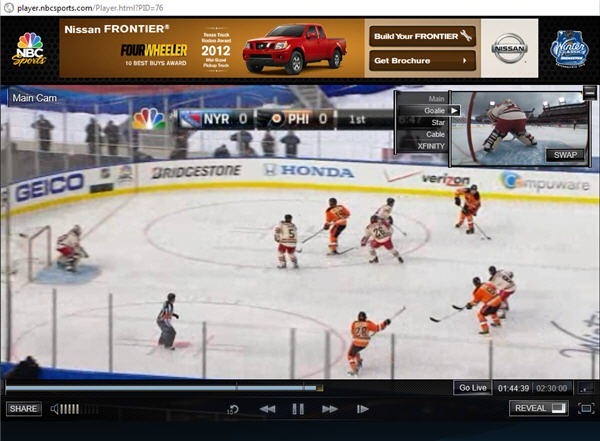 You can usually catch the replay for a limited time by going directly to the NHL Extra Live Player.